unsettle was a multi-arts project delivered by Digi Youth Arts as part of a long-term artist in residency at the Queensland Museum. 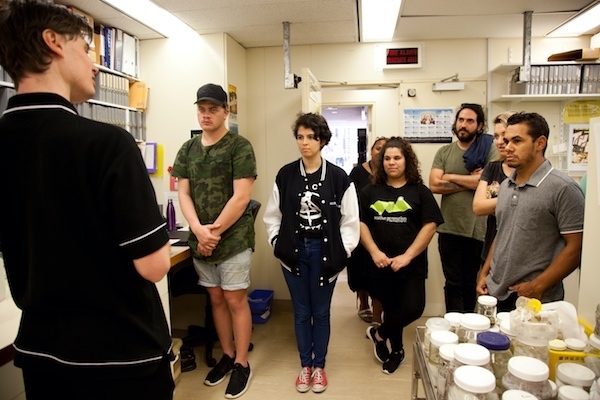 Supported by renowned Queensland-based Indigenous artists, Aboriginal and Torres Strait Islander young people responded to the cultural landscape of major arts institutions through street art, theatre, film, visual art, dance and music. The project produced two long term exhibitions in street art and visual art, a new theatre work, 4 short-films, 2 dance works and a music collaboration culminating in a album and performance. Digi Youth Arts Youth Artists were mentored by: Land Writers (Warraba Weatherall + Daniel Jones) and Mz Murri Cod (Libby Harward) in Sreet Art, Alethea Beetson in Theatre, Ej Garrett and Tamara Whyte in Film, Ryan Presley in Visual Art, Katina Olsen and Hanz Ahwang-Ware in Dance and Luke Daniel Peacock in Film. Photographer LaVonne Bobongie led the documentation of this project (images below). Digi Youth Arts + Queensland Museum were recognised for their success with the unsettle project when they received a Museums and Galleries Nations Award for Indigenous Project or Keeping Place in 2018.